Mikri and Megali (small and big in Greek) Peza are located at the northern coast in Gavrio area. From Gavrio we take the road to Ano and Kato Fello, we cross the fork to Myrmigies, take the right turn middleland and at the next fork we meet we turn left. After Sidonta a country road leads us to chartes and finally to the beaches Mikri and Megali Peza. There's also another road from Kalyvari. The beach is beautiful with pebbles and good for fishing. 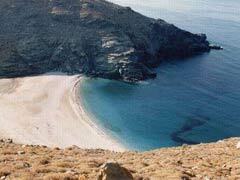 Since it faces the north it is not suitable for the middle summer days when meltemia (the North cycladic wind) blows.